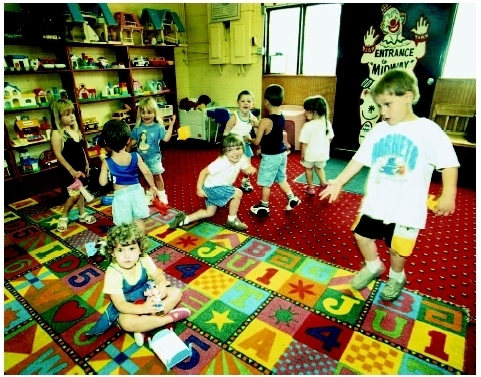 Chidren during play time at a day-care center. See also Attachment between infant and caregiver . National Association of Child Care Resource and Referral Agencies (NACCRRA). 1319 F. Street, NW, Suite 500, Washington, DC 20004–1106. Web site: http://www.naccrra.org. Ehrle, Jennifer, et al. "Who's Caring for Our Youngest Children? Child Care Patterns of Infants and Toddlers." Urban Institute , January 1, 2001. Available online at http://www.urban.org/urlprint.cfm?ID=7495 (accessed January 11, 2005). Fiene, Richard. "13 Indicators of Quality Child Care: Research Update." United States Department of Health and Human Services , 2002. Available online at http://aspe.hhs.gov/hsp/ccquality-ind02/ (accessed January 11, 2005). "Indicators of Child, Family, and Community Connections: Family, Work, and Child Care." United States Department of Health and Human Services , 2004. Available online at http://aspe.hhs.gov/hsp/connectionscharts04/ch3.htm (accessed January 11, 2005).